Watch the Josh Barnett vs Roy Nelson - UFC FN 75 lats September 26, 2016. 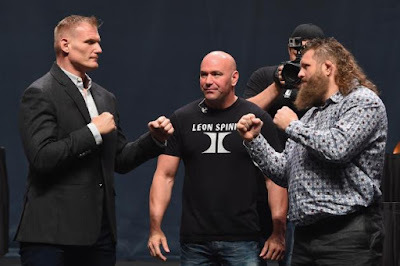 That is Josh Barnett shook off a near two-year layoff on Saturday night to outpace Roy Nelson in a grueling five-round heavyweight affair, breaking the UFC's single-fight divisional record by landing a whopping 146 significant strikes on the chin and belly of "Big Country." The win topped off an already entertaining return to Japan, thanks in large part to Uriah Hall's stunning Mortal Kombat finish of Gegard Mousasi in the night's co-main event. Watch for now!